Since peace is lived in the daily circumstances of life, The Word of God - the Word of Peace highlights the prophets who tried to help the people of their day find peace in the nitty gritty of life. It is not so much about the prophets as it is about the call of prophecy given each baptized person. The commitment to prophetic peace is highlighted in the teachings of Old and New Testament prophets illuminated by the life and teachings of Jesus Christ, the Prince of Peace. Section one of The Word of God - the Word of Peace invites us to reflect on God's request. The idea of peace is God's, and God invites others to spread the word. Section two follows with the response of the peacemaker, the decision to be with God in the work of peace. Section three focuses on the decisions for peace. When does justice, the foundation of peace, demand that we say yes" and when *no - ? 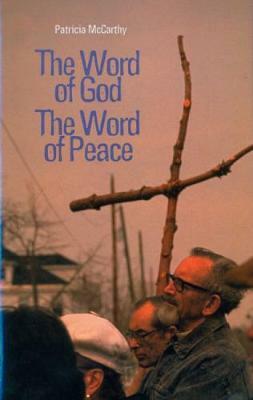 In the final section, Sr. McCarthy deals with the reward of those who are faithful to God's plan, stating that even the results of peace need scriptural understanding. She encourages people both individually and communally to immerse themselves in the desires of God, discern the ways of God for our time and our place, and celebrate with others the cry of God for peace and justice for all people. Society has programmed us to violence so that we cannot imagine or even take seriously the reality of peace. The Word of God can penetrate our incredulity, enlighten our Vision, and strengthen our resolve to be the people of peace God desires now and has always desired from the beginning of time. Since peace is lived in the daily circumstances of life, The Word of God - the Word of Peace highlights the prophets who tried to help the people of their day find peace in the nitty gritty of life. It is not so much about the prophets as it is about the call of prophecy given each baptized person. The commitment to prophetic peace is highlighted in the teachings of Old and New Testament prophets illuminated by the life and teachings of Jesus Christ, the Prince of Peace. Section one of The Word of God - the Word of Peace invites us to reflect on God's request. The idea of peace is God's, and God invites others to spread the word. Section two follows with the response of the peacemaker, the decision to be with God in the work of peace. Section three focuses on the decisions for peace. When does justice, the foundation of peace, demand that we say *yes - and when *no - ? In the final section, Sr. McCarthy deals with the reward of those who are faithful to God's plan, stating that even the results of peace need scriptural understanding. She encourages people both individually and communally to immerse themselves in the desires of God, discern the ways of God for our time and our place, and celebrate with others the cry of God for peace and justice for all people. Society has programmed us to violence so that we cannot imagine or even take seriously the reality of peace. The Word of God can penetrate our incredulity, enlighten our Vision, and strengthen our resolve to be the people of peace God desires now and has always desired from the beginning of time.